Your statistical software probably provides a function that computes quantiles of common probability distributions such as the normal, exponential, and beta distributions. Because there are infinitely many probability distributions, you might encounter a distribution for which a built-in quantile function is not implemented. No problem! This article shows how to numerically compute the quantiles of any probability distribution from the definition of the cumulative distribution (CDF). How to compute quantiles for the contaminated normal distribution. Computing a quantile would make a good final exam question for an undergraduate class in numerical analysis. 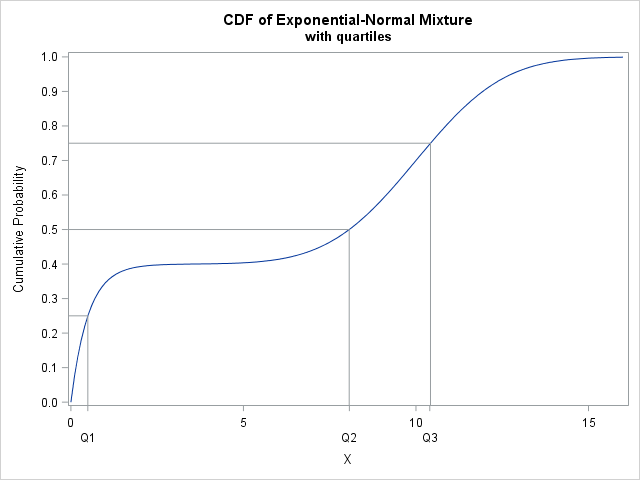 Although some distributions have an explicit CDF, many distributions are defined only by a probability density function (the PDF, f(x)) and numerical integration must be used to compute the cumulative distribution (the CDF, F(x)). A canonical example is the normal distribution. I've previously shown how to use numerical integration to compute a CDF from a PDF by using the definition F(x) = ∫ f(t) dt, where the lower limit of the integral is –∞ and the upper limit is x. Whether the CDF is defined analytically or through numerical integration, the quantile for p is found implicitly as the solution to the equation F(x) = p, where p is a probability in the interval (0,1). This is illustrated by the graph at the right. SAS/IML software provides the QUAD subroutine, which provides numerical integration, and the FROOT function, which solves for roots. Thus SAS/IML is an ideal computational environment for computing quantiles for custom distributions. The previous section shows the graph of the CDF on the interval [0, 16]. The vertical and horizontal lines correspond to the first, second and third quartiles of the distribution. The quartiles are close to the values Q1 ≈ 0.5, Q2 ≈ 8, and Q3 ≈ 10.5. The next section shows how to compute the quantiles. As long as you can define a function that evaluates the CDF, you can find quantiles. For unbounded distributions, it is usually helpful to plot the CDF so that you can visually estimate an interval that contains the quantile. (For bounded distributions, the support of the distribution contains all quantiles.) For the mixture distribution in the previous section, it is clear that the quantiles are in the interval [0, 16]. The following program finds arbitrary quantiles for whichever CDF is evaluated by the CustomCDF function. To find quantiles for a different function, you can modify the CustomCDF and change the interval on which to find the quantiles. You do not need to modify the RootFunc or CustomQuantile functions. In summary, you can compute an arbitrary quantile of an arbitrary continuous distribution if you can (1) evaluate the CDF at any point and (2) numerically solve for the root of the equation CDF(x)-p for a probability value, p. Because the support of the distribution is arbitrary, the implementation requires that you provide an interval [a,b] that contains the quantile. The computation should be robust and accurate for non-pathological distributions provided that the density is not tiny or zero at the value of the quantile. Although this example is illustrated in SAS, the same method will work in other software. It is informative artical. It provided information about functions, computing quantiles and distribution. 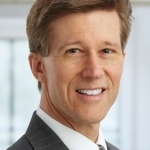 We don't have SAS/IML...could this be done using PROC FCMP? Probably. THE FROOT function is not available in PROC FCMP, but you can use the SOLVE function to find the quantile, given a probability. The SOLVE function requires an initial guess for the quantile.